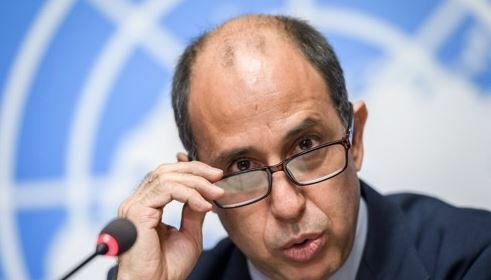 Tomas Ojea Quintana, the UN's special rapporteur on human rights in North Korea, called on Pyongyang to "issue a general amnesty to release hundreds of prisoners". He hailed North Korea's recent release of three US prisoners, and urged the country to broaden its "amnesty" to anyone being arbitrarily detained there, which he said was basically all prisoners. "There is no rule of law in the country... no due process of law," he told reporters in Geneva. He said he understood prisoner releases would be part of a possibly drawn-out process and that Pyongyang would not throw open all its prisons doors immediately. But he said he thought "a good signal of the government would be to start releasing prisoners". His comments came less than a week before unprecedented talks between North Korean leader Kim Jong Un and US President Donald Trump are due to take place in Singapore. The summit is scheduled for June 12 following a rapid detente between Pyongyang and Washington -- as well as South Korea -- in a turn-around from a dramatic escalation of tensions last year, when the North ratcheted up its nuclear weapons programme. Ojea Quintana told reporters he was hosting the Geneva press conference "because unfortunately nobody invited me to Singapore". But he said he still hoped a discussion of human rights would figure on the summit agenda and during subsequent negotiations. "I believe that... human rights should not (be lost from) sight in the context of the negotiations on the denuclearisation of the DPRK and beyond," he said, using the official acronym for the country. "It is very important that human rights are raised because otherwise it will be... a problem in terms of building a sustainable agreement with DPRK in regard to the denuclearisation," he said. The isolated North has been accused of a litany of state-sanctioned rights abuses including extrajudicial killing, torture, brutal crackdowns on dissent and even kidnapping foreign citizens. North Korea is estimated to have up to 120,000 political prisoners in its sprawling gulag system. A UN commission published a searing report in 2014 which concluded North Korea was committing human rights violations "without parallel in the contemporary world". And the US State Department's latest rights report on the North, released earlier this year, describes "egregious human rights violations" in the authoritarian state, from public executions to widespread surveillance of citizens. But Trump acknowledged earlier this month that he has not raised the issue of human rights during the preparation stage for the summit. Ojea Quintana said he did not believe that raising the rights issue would "undermine the opening and the talks on denuclearisation at all". The rapporteur also made several other pre-summit recommendations, including a review of the impact harsh sanctions are having on the rights of the North Korean people, including the right to adequate food. The UN estimates that some 10 million people in the country are in need of humanitarian aid, while UN aid efforts in the country are dramatically underfunded, Ojea Quintana said. "The situation is quite critical," he said. Ojea Quintana also urged North Korea to change its attitude towards him and his UN mandate. To date, Pyongyang has refused to engage with him at all or to allow him into the country. An about-face on that stance, he said, would lend "credibility to their intentions to engage with different stakeholders and their intentions to denuclearise".